In stock. Order in the next 11 hours, 38 minutes and it will go out today! Kids love puppets and kids love magic. 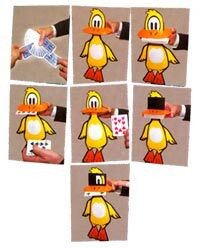 So, kids are really going to love Pancho the Pickin' Duck when he does a card trick while blindfolded! Watch the video and you’ll see the appeal that this darling, pack-flat-play-big, yellow duck will have on your audience. There are tons of opportunities for jokes, banter and physical humor between you and Pancho—even before you get to the card trick. Then, have him reveal one selected, signed card, or have him find a bunch of alphabet cards to spell the birthday kid’s name. He can even find the duck card in a pack of animal flash cards if you give him a chance! If you’re familiar with the classic “Gwendolyn the Card Duck,” you’ll love Pancho. He’s a puppet, specially made from heavy card stock. There’s a secret gimmick in his mouth that’ll help you help him find the right card every single time. Pancho has so many magical possibilities. When you add him to your show, the kids are sure to "quack" up!